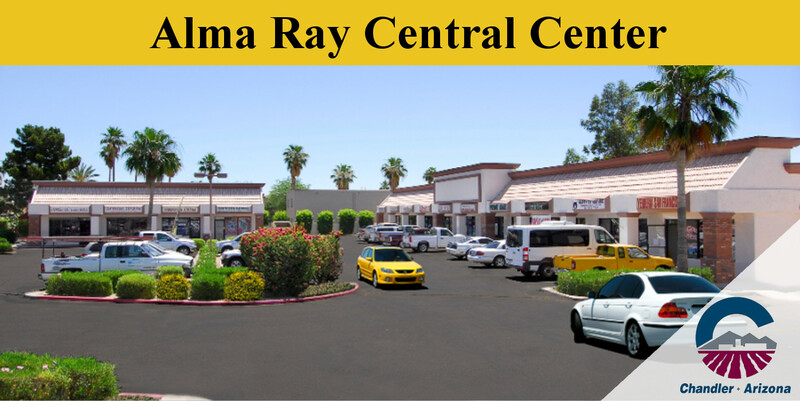 Alma & Ray Central Center is a 14,694 square foot retail strip center located on the Southeast corner of Alma School and Ray roads in Chandler, Arizona. The property includes a Water ‘n Ice convenience store and is occupied by a variety of businesses that provide the local community with jobs, retail goods and services. This retail center has excellent visibility and signage on highly traveled Alma School and Ray Road. 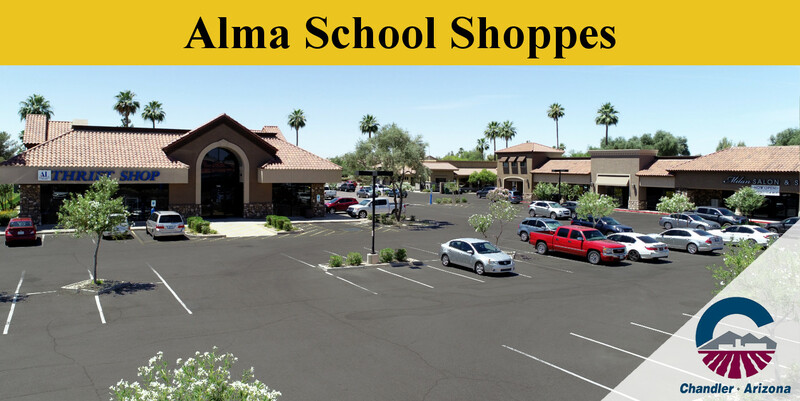 The intersection of Alma School and Ray roads, which includes notable retailers such as Goodwill, Boston Market, Trails and Pruitt’s Furniture, was widened in 2012 increasing the shopping centers accessibility and overall exposure to local traffic. The intersection receives an average of approximately 47,000 (2014 Sites USA) cars on a daily basis. Other neighboring retailers within the trade area include Wal-Mart, Fry’s Food & Drug Store, Bealls Fashion, Starbucks, Jamba Juice, Ace Hardware, Dunkin Donuts and Wells Fargo to name a few. 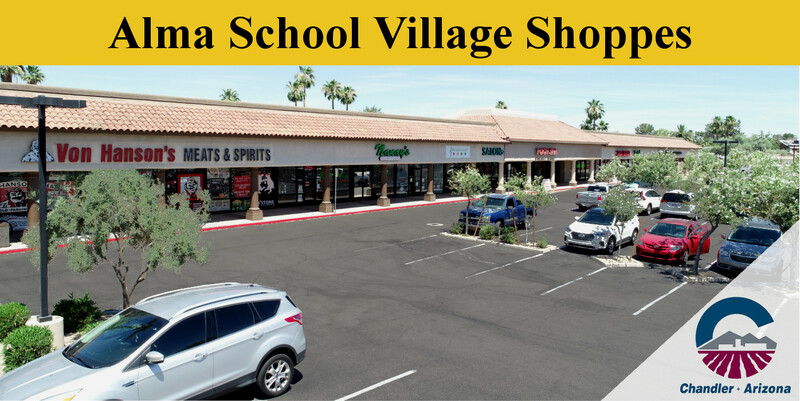 Alma School Village Shoppes is a vibrant 27,000 square foot retail strip center located along highly traveled Alma School Road, just north of Warner Road in Chandler, Arizona. 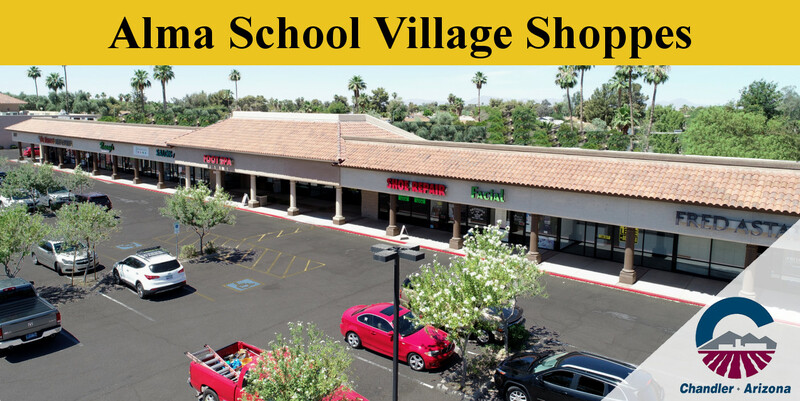 This retail property’s long term stability can be partly attributed to its location on Alma School Road, a major arterial street in one of Chandler’s key transportation corridors, which serves the local community. This retail center is anchored by friendly old-fashioned Von Hanson’s Meat Market & Spirits plus local favorite Fred Astaire Dance Studio. This well positioned retail property is occupied by a variety of locally owned businesses that attract a wide range of consumers. 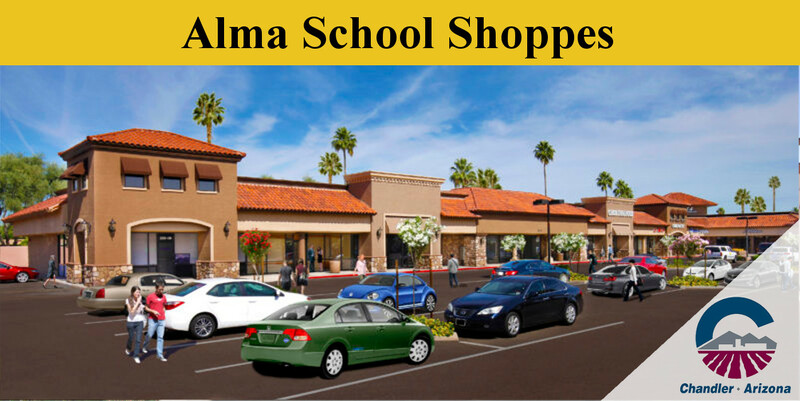 Alma School Village Shoppes is within 3 miles of the US-60 and Loop 101 freeways. The strip center’s neighboring communities consists of 139,527 households and approximately 366,700 people within a 5 mile radius. The surrounding area is home to many National retail chains including Wal-Mart, Fry’s Food Store, Bealls Fashions, Jamba Juice, Ace Hardware, Big Lots and a 99 Cent Only Store. The City of Chandler is one of the fastest growing communities in the Phoenix metropolitan area and home to major employers such as Intel, Freescale Semiconductor, Microchip Technologies, Chandler Regional Medical Center and Orbital Science. 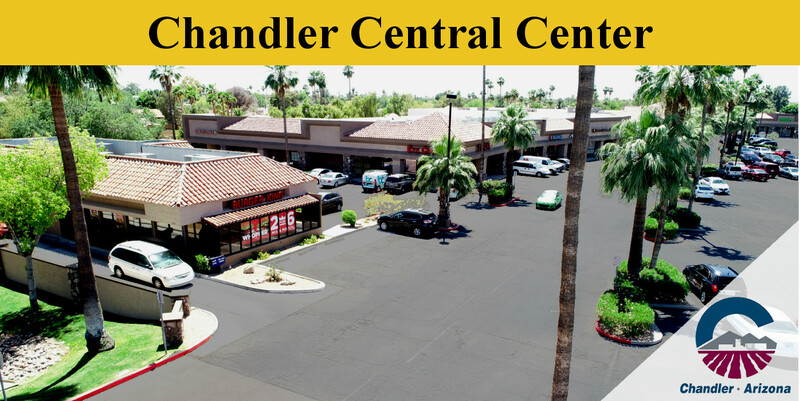 Chandler’s positive economic growth during the last decade has strengthened its reputation throughout the country as an ideal location to start, expand or relocate a business. Dobson Plaza is a 26,588 square foot retail strip/office center located on the Northwest corner of highly traveled Dobson and Elliot Road in Chandler, Arizona. The exceptional visibility and retail signage along both major arterial roads provides tenants with excellent exposure to over 58,000 cars on a daily basis. 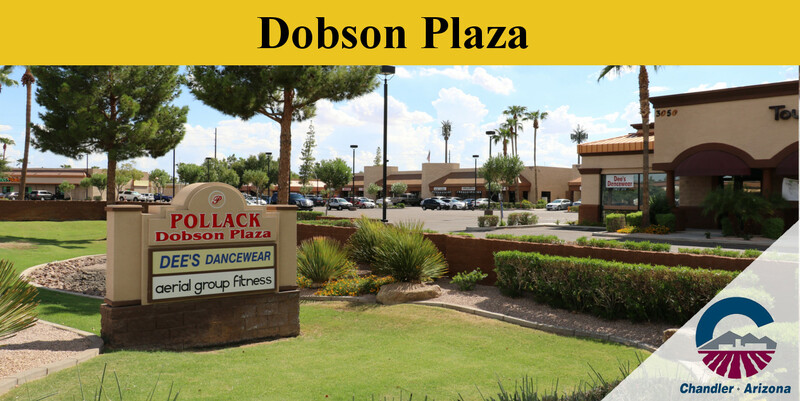 Dobson Plaza incorporates several design elements that make this location superior to other nearby comparable properties and currently includes businesses such as Batteries Plus, Dee’s Dance Wear and Tough Lotus Aerial Fitness. 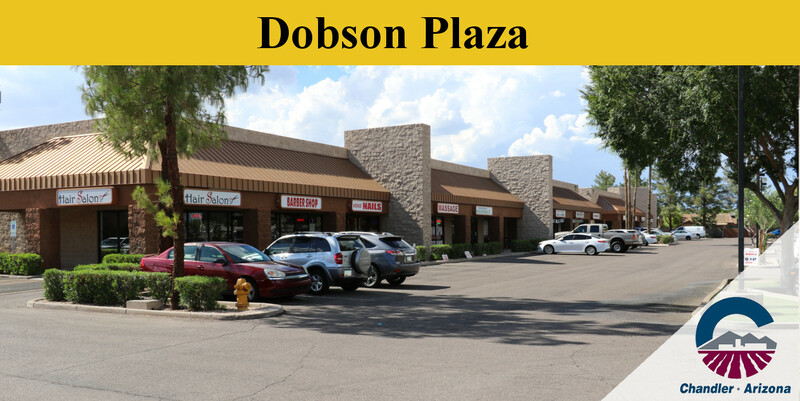 Dobson Plaza is conveniently located within 1 mile of Hwy 101 and several high density office developments at intersecting Loop 101 and Elliot Road. ASU Research Park, Freescale Semiconductor Inc. and State Farm currently occupy a combined total of over one million square feet of office space on the west side of the Loop 101. These reputable companies in addition to local business establishments have dramatically increased the daytime employment in the surrounding trade area. 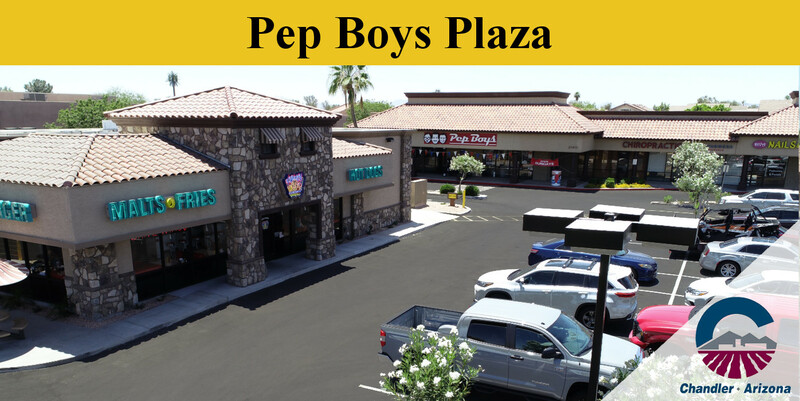 Pep Boys Plaza is one of the most prominent retail centers along highly traveled Alma School Road in Chandler, Arizona. Currently anchored by Pep Boys Auto, this 22,516 square foot retail strip center provides businesses a high traffic location at affordable lease rates and sits directly across the street from a Walmart Store. Like all other Michael Pollack Real Estate Investments, the property is continuously maintained, regularly updated and looks as attractive today as the day it was built. Its modern design elements and lush landscaping make Pep Boys Plaza a perfect location for almost any new, relocating or expanding business. 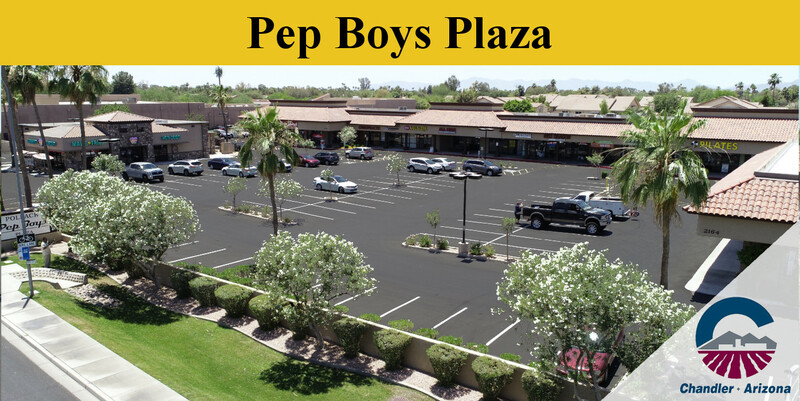 Pep Boys Plaza is located within approximately 3 miles of the US-60 and Loop 101 freeways. This retail center’s surrounding community consists of over 142,846 households and approximately 373,754 people within a 5 mile radius. The surrounding area is home to many National retail chains including, Wal-Mart, Bealls Fashions, Starbucks, Jamba Juice, Ace Hardware, Big Lots, and a 99 Cent Only Store. Chandler Central Center located on the southwest corner of Alma School Rd. and Elliot Rd. in Chandler, Arizona, is a large neighborhood retail shopping center that currently houses several notable tenants including Planet Fitness, Burger King, Empire Beauty School, Little Caesar’s Pizza and Catherine’s Plus Size Clothing store. The impressive size of this retail center at approximately 179,007 square feet makes this location one of the largest retail centers in the area. 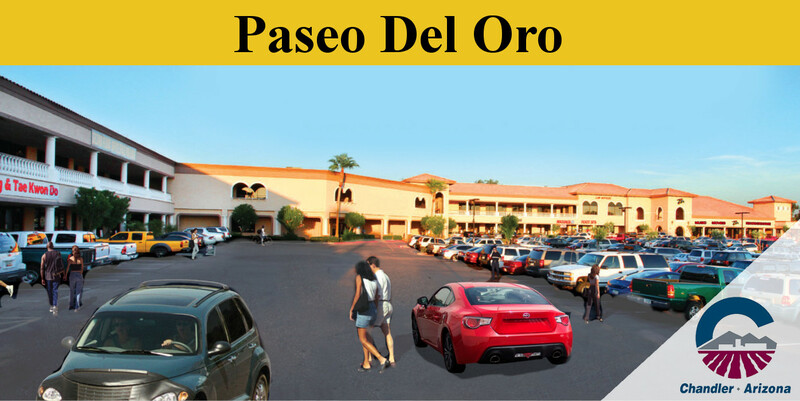 Situated on over 16 acres of land, it provides spacious parking for consumers to enjoy. 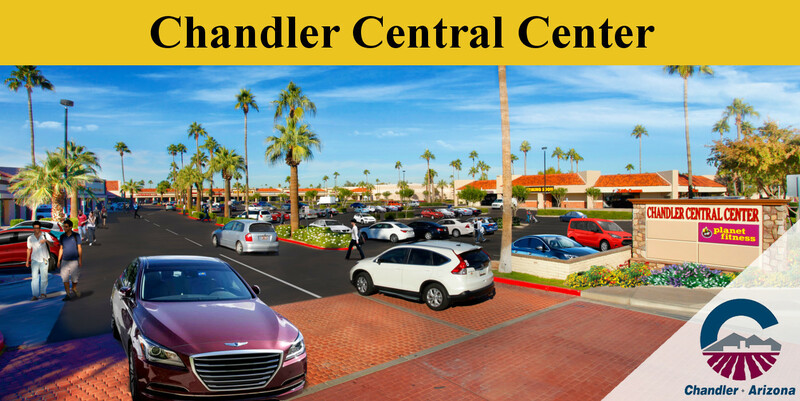 Chandler Central Center has been exquisitely maintained, looking as good today, as the day it was built. This center is located less than two miles from both Highway 60 and Loop 101. 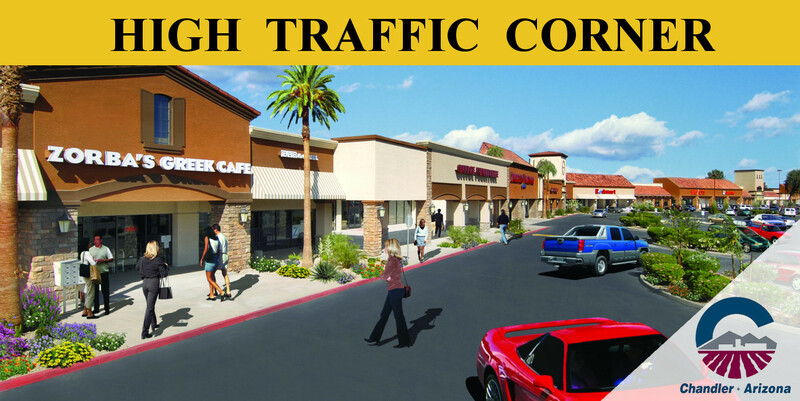 Businesses located at Chandler Central Center are accessible to over 386,454 people within a 5 mile radius and gain direct exposure to over 53,000 cars that pass through the highly-traveled intersection of Alma School and Elliot Roads. The intersection is home to many national chains including Fry’s Food & Drug Store, Starbucks, Bank of America, and Compass Bank. Other national retailers within the trade area include Safeway Marketplace, Big Lots, 99 Cents Store, Wal-Mart, Fry’s Food & Drug Store, Bealls Fashion, Starbucks, Jamba Juice, Ace Hardware, Dunkin Donuts, Walgreens Drug Store, and Wells Fargo – just to name a few. 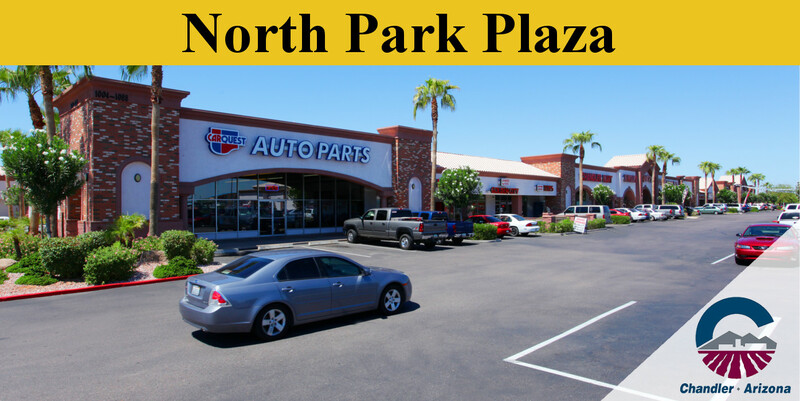 North Park Plaza on the Northwest corner of Arizona Avenue and Ray Road is a grocery anchored retail shopping center that fronts on highly traveled Arizona Avenue less than 1.5 miles north from Downtown Chandler. This retail shopping center is anchored by family-owned and operated El Rancho Market. North Park Plaza was strategically acquired due to its prominent location along Arizona Avenue as well as the surrounding sub-markets potential for growth. In 2004, North Park Plaza underwent an extensive renovation specifically designed to serve the needs of the local community. Aesthetically pleasing design elements and a stable tenant mix, including Pizza Hut, Bosa Donuts, Chandler Fashion Mart and Cricket Wireless, transformed North Park Plaza into a vibrant, highly sought after retail location to operate your business. 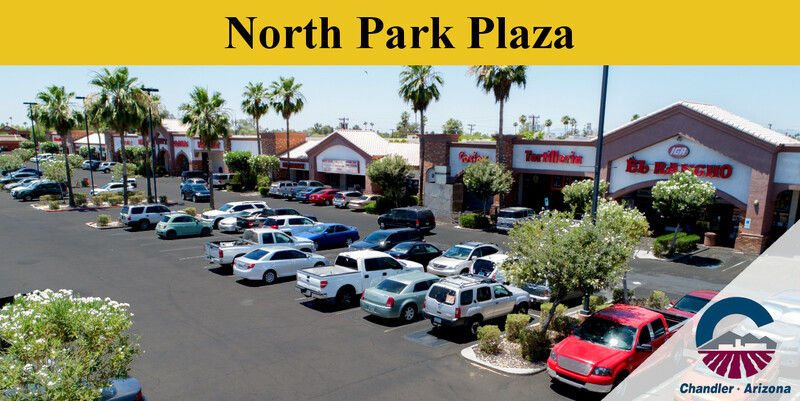 North Park Plaza is located in Chandler, Arizona which is one of the fastest growing communities in the Phoenix metropolitan market. North Park Plaza’s main cross streets provide incredible access and exposure for the tenants in this shopping center with more than 55,000 cars passing by every day. There are a variety of notable National tenants neighboring North Park Plaza including McDonalds, Walgreens Drug, Family Dollar Store, Aarons Rents, Payless Shoe Source, Truly Nolan and Pizza Patron. 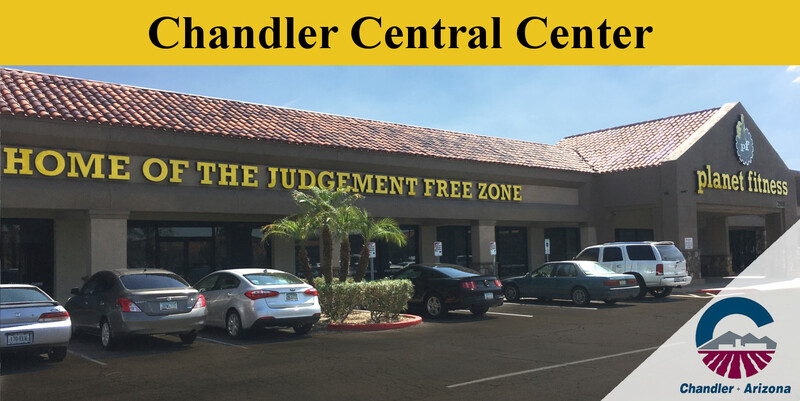 The center is located within 3 miles from both Loop 101 and Loop 202 (San Tan) freeway and approximately 1.5 miles north of downtown Chandler, Arizona. 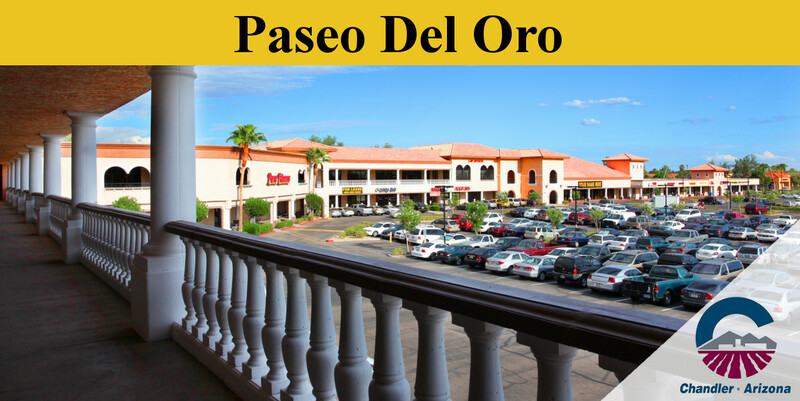 Paseo Del Oro retail shopping center is located on the highly traveled Northeast corner of Alma School and Elliot roads providing great exposure to these two main arteries in Chandler. This center has ample parking and incredible monument signage. The center is excellently maintained and has professional landscaping that makes it more desirable than the day it was built. 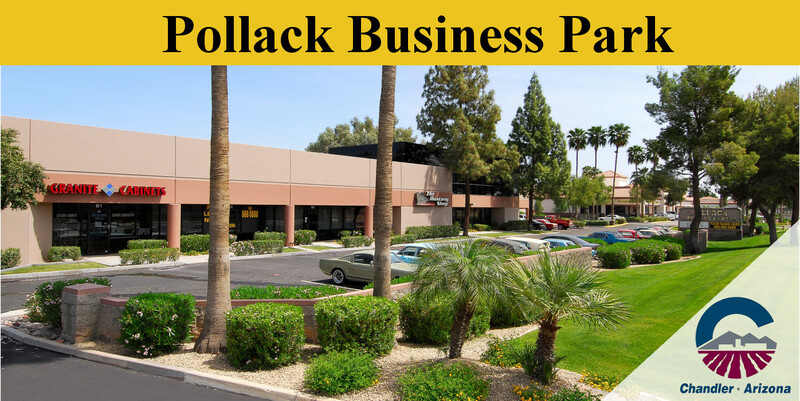 Pollack Business Park a light industrial /office /warehouse center, has been in the heart of Chandler Arizona, serving the needs of the community since its construction in 1987. This center has prime frontage and exceptional visibility along highly traveled Elliot Road. Like all other Michael Pollack real estate projects, this Chandler industrial building is continuously maintained, regularly updated and looks as good today as the day it was built. Pollack Business Park is the home of tenants such as Truly Nolan, a regional leader in pest control and The Mustang Shop. The 19,406 square foot industrial building is a perfect location for almost any new, relocating or expanding business that requires office and warehouse space with street front retail visibility. The intersection of Arizona Avenue and Elliot Road sees 54,000 cars per day and is located less than 3 miles from both US 60 and Loop 101 freeways and one mile east of highly traveled Alma School Road. 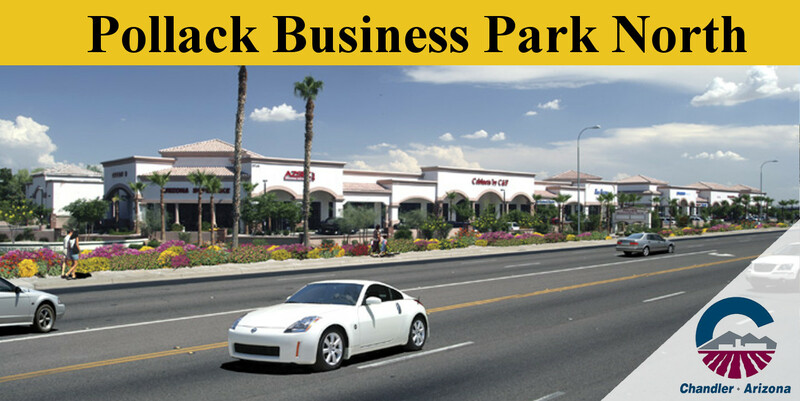 Pollack Business Park in Chandler is part of one of the fastest growing communities within the Phoenix metropolitan area. The City’s upward growth trend during the last decade has strengthened its reputation throughout the country as a cutting edge and innovative leader in business and residential development. 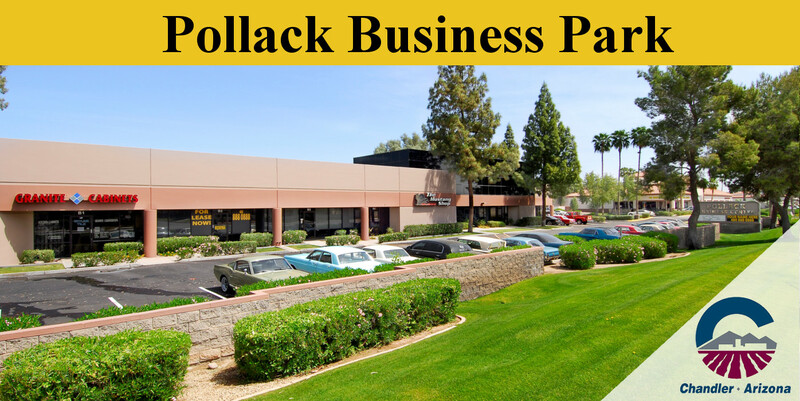 Pollack Business Park North is located at the Northeast Corner of Arizona Ave and Elliot Road in Chandler, Arizona. This project represents an exciting Light Industrial Showroom development by Michael A. Pollack Real Estate Investments. Newly constructed in 2005, this project is one of the premier locations in the Chandler commercial/ industrial real estate market and the perfect location for any new, expanding or relocating industrial or store front business owner. 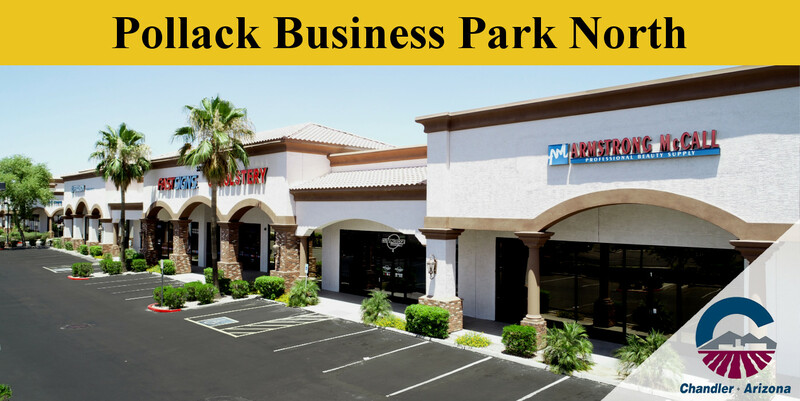 Pollack Business Park North of Chandler fronts on the highly traveled Arizona Ave and is located in one of the fastest growing communities in the Southwest United States and plays host to many of the world’s top manufacturing and tech firms. The City’s upward growth trend during the last decade has strengthened its reputation throughout the country as a cutting edge and innovative leader in business and residential development. 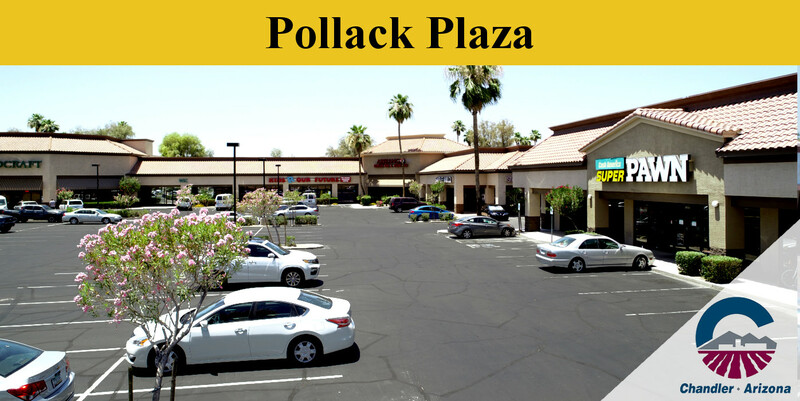 Pollack Plaza is located on the Northwest corner of highly traveled Elliot Road and Arizona Ave (State Route 87), in the heart of Chandler, Arizona. This retail shopping center has successfully served the diversified needs of the surrounding community for many years. This great tenant mix and high visible retail center, fronts on both Elliot Road and Arizona Avenue. Pollack Plaza has been meticulously maintained and looks just as good as the day it was built. This key location generates approximately 56,000 cars per day, and is only moments away from both US-60 and Loop 101 freeways. This property is a perfect location for almost any new, relocating or expanding business. 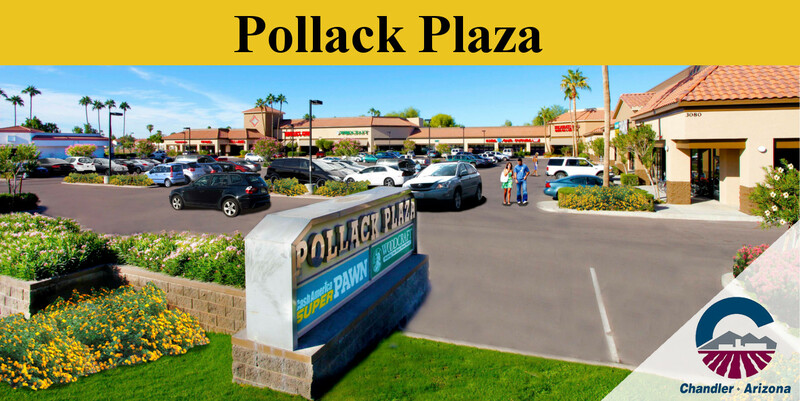 Pollack Plaza is centrally located in one of the fastest growing communities within the Phoenix metropolitan area. The trade area has attracted National tenants such as Target, Walmart, Jimmie Johns, Dollar Tree Store, Subway, Safeway Grocery, Fry’s Food & Drug Store, Pizza Hut, Starbucks, O’Reilly Auto Store, Sonic Burger, Bank of America, Compass Bank and Circle K. The City of Chandler’s upward growth trend during the last decade has strengthened its reputation throughout the country as a cutting edge, innovative leader in business and residential development. 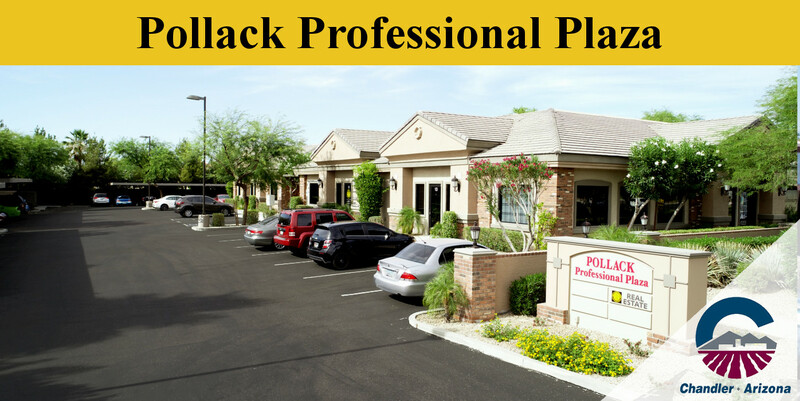 Pollack Professional Plaza is a garden-style medical/office building with great street visibility, ample parking, covered parking and excellent monument signage and is located on the Northwest corner of highly traveled Alma School and Frye Road in Chandler, Arizona. This property is the perfect location for professional or medical tenants. Designed around a common area that resembles an outdoor oasis, this complex was specifically planned to offer its tenants direct exposure to the main arteries of Alma School and Frye Roads. The combined level of ambiance with a key level of exposure is unprecedented when compared to other office buildings in its sub-market. Through the innovative designs of this site and its exterior, this property will offer medical and professional tenants a significant advantage over any competitors they may have due to the close proximity to Chandler Regional Medical Hospital and the new construction of Chandler Banner Health Center. 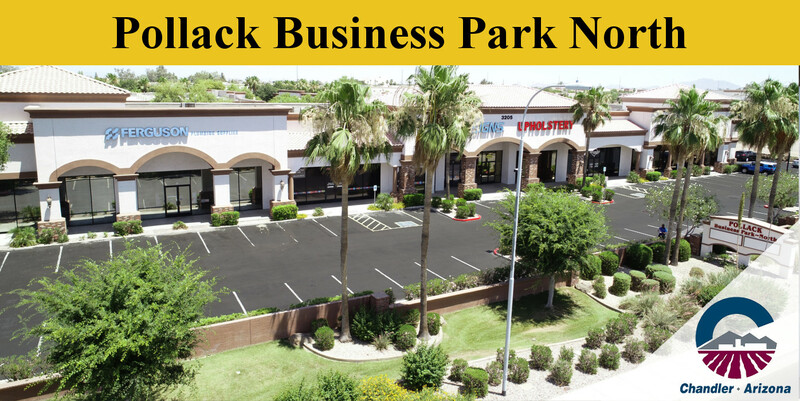 Pollack Professional Plaza is in the heart of the dynamic and rapidly growing South Chandler sub-market. 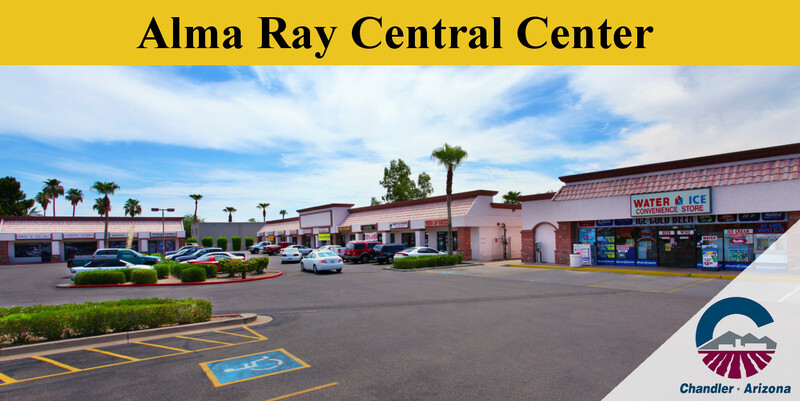 This property is conveniently located approximately 2 miles north of the Loop 202 South Freeway, one mile east of Chandler Regional Medical Hospital and and just west of Historic Downtown Chandler. 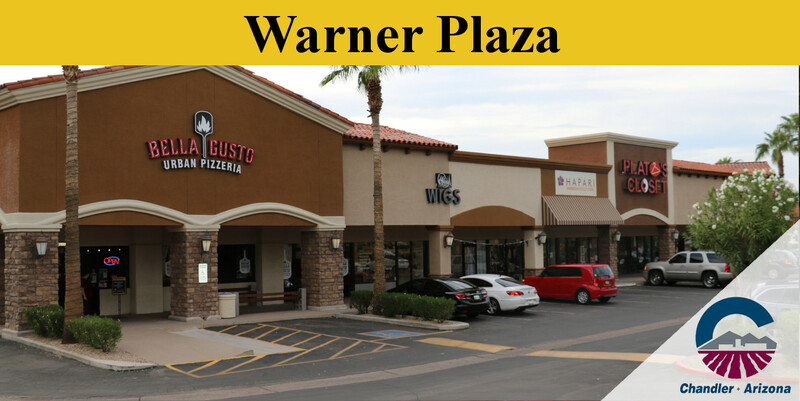 Warner Plaza is a retail shopping center that is located on the Southwest corner of Alma School Road and Warner Road in Chandler and contains approximately 132,655 square feet. Warner Plaza located at one of the most active intersections in Chandler, Arizona. This property underwent an extensive renovation in 2008 which involved an elaborate exterior design that delivered an attractive retail shopping center for the local residents to enjoy. The excellent mix of local, regional and National Tenants, which include Big Lots, 99 Cent Only Store, Sweeties Candies, Chase Bank, and Carl’s Jr, offers a variety of great products and services to the surrounding communities. The prime location of Warner Plaza is easily accessible and highly visible with signage on both arterial roads. This property offers an excellent location for almost any retail operation looking to establish, expand or relocate their business. 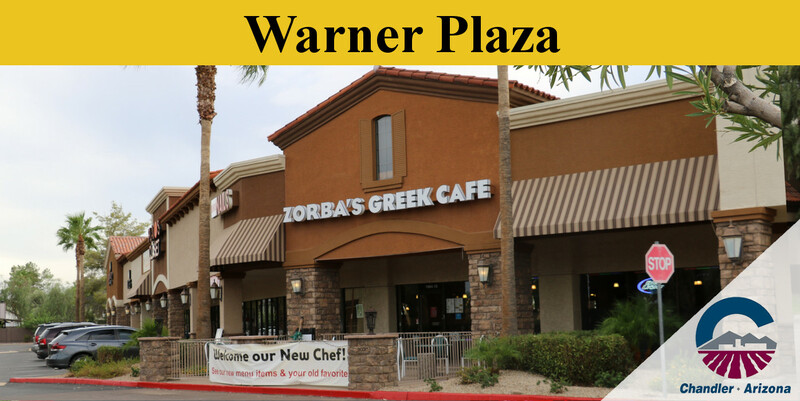 Warner Plaza is approximately 2 miles from the Loop 101 freeway at one of Chandler’s premier retail intersections. Other neighboring national retailers include Wal-Mart, Fry’s Food & Drug Store, Beall’s Fashion, Starbucks, Jamba Juice, Ace Hardware, Dunkin Donuts and Wells Fargo to name a few. The shopping center’s surrounding community consists of over 134,288 households and approximately 342,790 people within a 5 mile radius. The City of Chandler is one of the fastest growing communities in the Phoenix metropolitan area. Chandler’s upward growth trend during the last decade has strengthened its reputation throughout the country as an ideal location to start, expand or relocate a business. 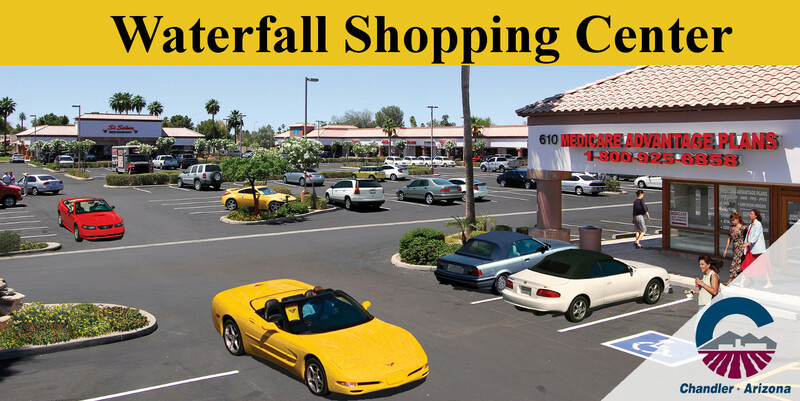 Waterfall Shopping Center is located on the Northwest corner of Alma School and Galveston is a 63,583 square foot neighborhood retail center located along highly traveled Alma School Road in Chandler, Arizona. The exterior renovation in 2003 revitalized the center’s vintage character and subsequently attracted locally owned businesses such as Si Senor Mexican Restaurant, Jeanne Wright School of Dance, Hidden Treasures Thrift Shop, Studio Academy of Beauty and ATA Taekwondo. 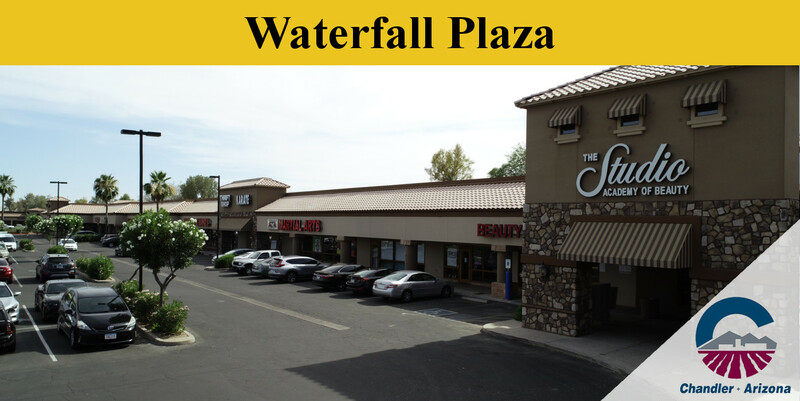 The aesthetically pleasing design elements of Waterfall Shopping Center have proven to be timeless and continue to provide a family friendly retail, office and dining environment for the surrounding community and its local residents to enjoy. 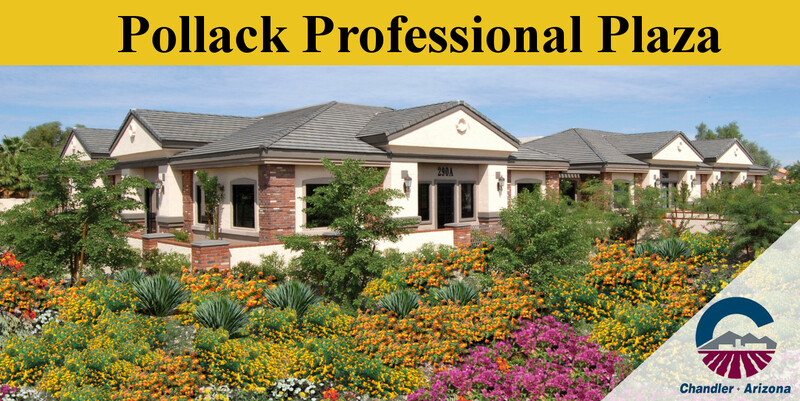 Chandler, Arizona is one of the fastest growing communities in the Phoenix metropolitan area. 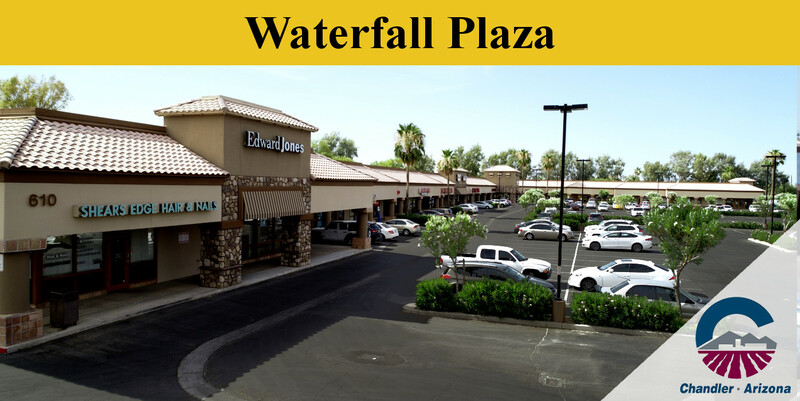 Waterfall Shopping Center is located less than 3 miles from the Loop 101 and only moments from the Chandler Fashion Square Mall. The surrounding area is home to many National retail chains including Wal-Mart, Fry’s Food Store, Bealls Fashions, Jamba Juice, Ace Hardware, Big Lots and a 99 Cent Only Store. The City of Chandler’s upward growth during the last decade has strengthened its reputation throughout the country as a preferred city to relocate or start your business. All of the information found throughout this website was produced using data from private and government sources deemed to be reliable (i.e. Sites USA 2016). The information herein is provided without representation or warranty and should be checked by the reader’s own preferred sources before making any decisions. The Property is subject to change or modification as may be made by the Landlord in its sole discretion or required by any authority having jurisdiction. Any and all measurements, distances or square footage are approximate. Landlord does not covenant or represent that any occupant currently or hereafter located at the Property, or nearby, will remain there as a tenant. Landlord makes no representations, either express or implied, as to the current or future addition or subtraction of tenants and/or occupancy of the Property. Michael A. Pollack Real Estate Investments © 2018 All Rights Reserved.